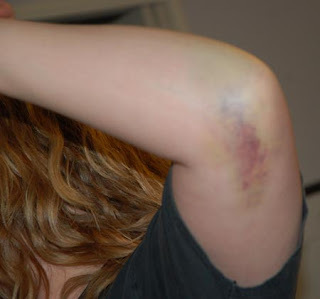 This is what a broken elbow looks like one week after the incident. Nice swelling with no indication of an elbow being under there – this is actually an improvement from 5 days ago. Amazingly enough, my elbow never hit the floor when I fell, rather I caught myself with the palm of my hand. The bruising is the result of the fracture itself, caused by a nice bone-to-bone chain reaction…pretty nifty, eh?